Any parent will agree that a baby bottle warmer is an indispensable baby item in their household. 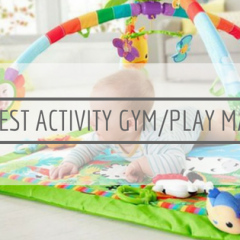 In fact, it is one of the three “treasures” that you should have when it comes to baby’s food – b﻿﻿aby﻿﻿﻿﻿﻿﻿﻿﻿ food m﻿﻿ake﻿﻿r, baby bottle warmer and baby bottle sterilizer. 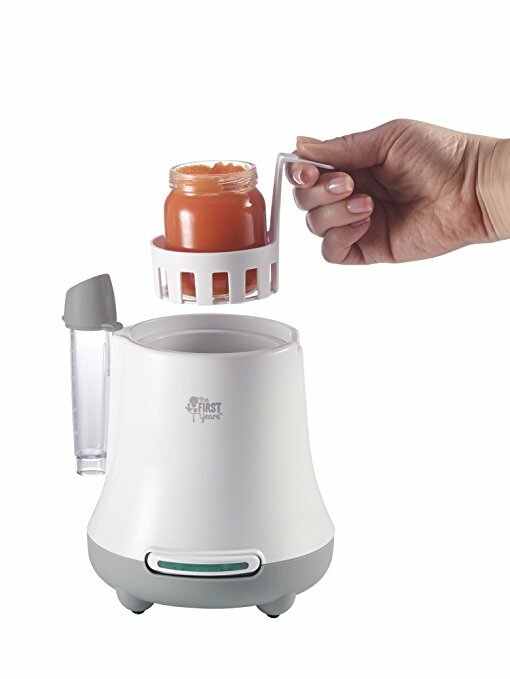 A baby food warmer makes parents’ life so much easier as you can pre-prepare baby’s food beforehand while they are playing or asleep and heat it up in an instant once they wake up or become hungry. This includes heating up frozen breastmilk! We all know how hectic it can get when baby cries for food, so anything that can minimize that duration is definitely welcomed! Check out our bottle warmer review below to find out what is the best bottle warmer for you! 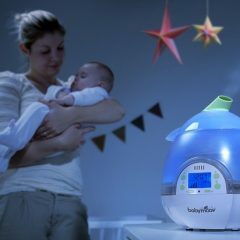 This is most raved by parents who found it to be a much better, improved version of the old Dr Brown’s Bottle ﻿﻿Warmer, which is also a great baby bottle warmer, but the deluxe version eliminates the leaking problem which many parents experience with their old model. 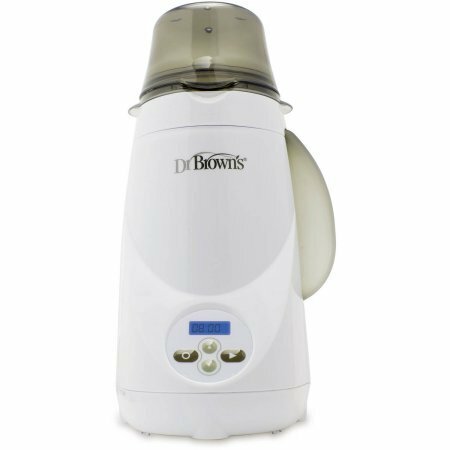 In a similar sleek, compact design, the Dr Brown’s Deluxe Bottle Warmer uses steam heat to warm baby bottles and food jars. With the Deluxe, you can warm several bottles before having to refill the water chamber. The adjustable basket also fits bottles of different sizes and brands, both standard and wide necks. You can adjust the settings on the LCD control panel and all it takes is just one push of a button to start the warming session. Once heating is done, you will be alerted by an alarm sound and even if you don’t the Dr Brown’s Deluxe Bottle Warmer will automatically shut down after being idle for 10 minutes. It’s always good to know that there’s one thing to worry about! You do have to wash this warmer regularly (at least once a week) because mould does grow, and rather quickly in fact, if otherwise. 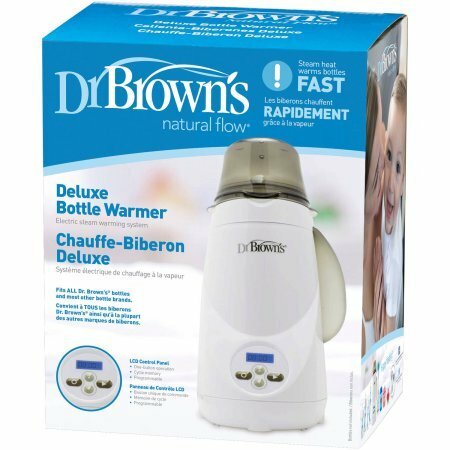 Nonetheless, if you are looking for a baby bottle warmer that warms up glass bottles, then the Dr Brown’s Deluxe Bottle Warmer is the best baby bottle warmer for glass bottles as Dr Brown has its own glass﻿﻿ bottles range as well (which is rated as one of the best glass baby bottles) and this bottle warmer is designed to cater for that as well. If you are a breastfeeding mother, we would recommend getting the Baby Brezza Safe & Smart Baby Bottle Warmer as it comes with 2 heating mode – Steady mode and Quick mode. 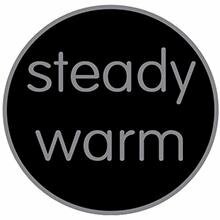 Steady Mode – uses warm water bath to gently heat breastmilk to body temperature, preserving essential nutrients. And it doesn’t take long, just minutes! 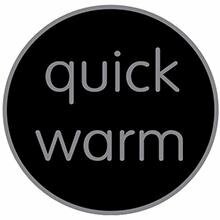 Quick Mode – if you are in a rush, use the quick mode and it will use steam heat to quickly warm up bottles to body temperature. Works best with formula and baby food jars! 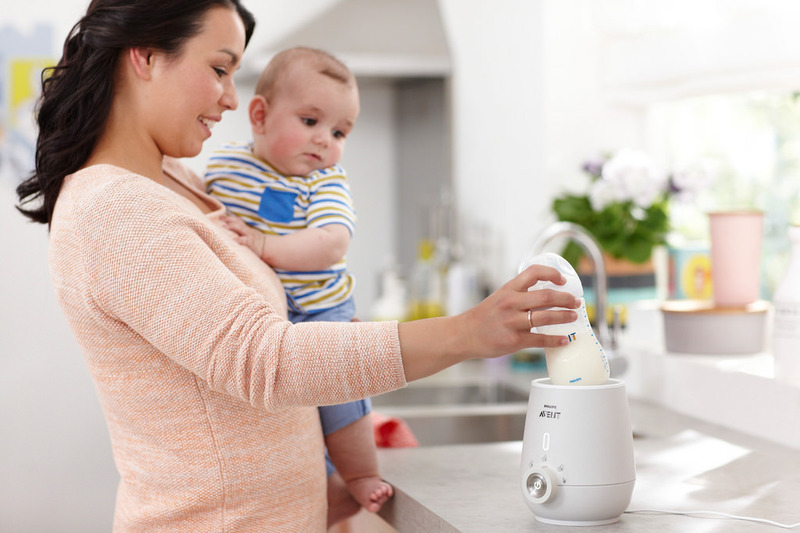 Yes, other baby bottle warmer can heat up breastmilk as well, but the Baby Brezza makes it so much easier because unless you know the best setting for heating up breastmilk, you may find your breastmilk losing its nutrients if it’s too warm or heated up too fast. 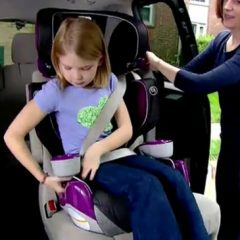 With the Baby Brezza, you do not have to worry about this. What’s even better is that it also comes with a Defrost setting, allowing you to safely defrost frozen breastmilk or baby food! With functions like these, it is no wonder the Baby Brezza is regarded by many parents to be the best bottle warmer for breast milk. 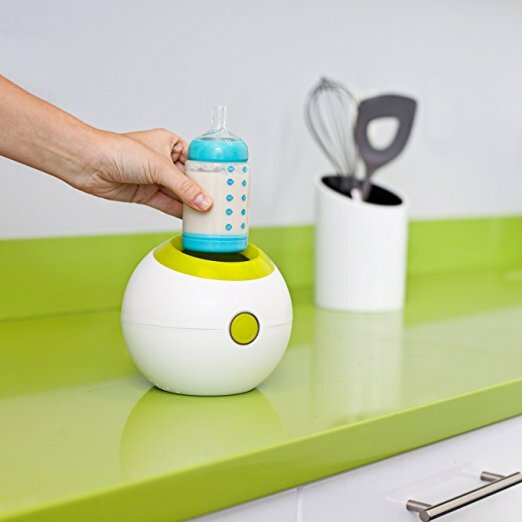 The Baby Brezza Safe & Smart Baby Bottle Warmer further convenient parents with their inbuilt technology which allow you to connect to your bottle warmer with your phone using their app. You can control your settings from your phone and it will even alert you once heating cycle is complete. 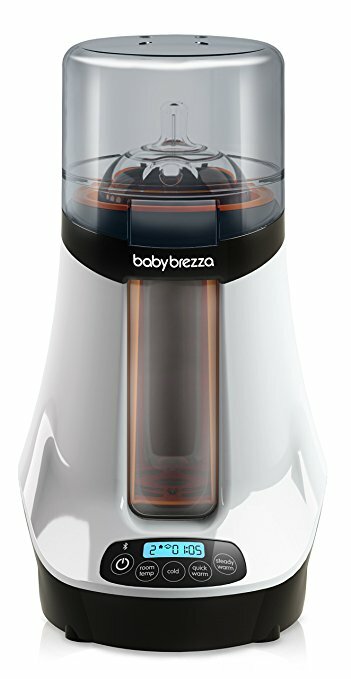 There is not much complaint about the Baby Brezza Safe & Smart Baby Bottle Warmer and understandably so because it is truly a wonderful product. Just remember to fill in water in accordance to the height of formula/breastmilk as some parents observed that it may not warm bottle up properly if there is too much water. 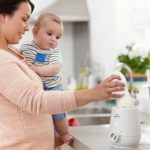 Indeed, this may be the best breast milk baby bottle warmer for parents who primarily breastfeed to have peace of mind that the valuable nutrients in their breastmilk will not be lost throughout the heating process. 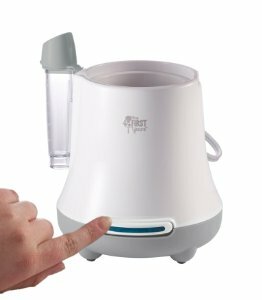 The First Years Quick Serve Bottle Warmer is one of the top rated bottle warmer and it is not hard to see why. It is perhaps also the most affordable bottle warmer in the market without compromising any heating function that other more expensive models have. Sleek and compact, it does not take up much counterspace and works well with most wide, narrow, angled and even disposable bottles. You can warm bottles of formula and breastmilk by simply adding water into the chamber using the included measuring vial for accurate water measurement and press a button to start heating. A basket insert is provided as well to warm food jars in just minutes. Parents also use the basket to sterilize pacifiers as the basket also comes with a lid. The automatic shut-off function means there is one less thing to worry about once heating is done for added safety. One of the downside of this bottle warmer is that it does not have an on/off switch. This means you will have to plug and unplug it each time after using it and this can be quite a hassle. Also, some has noticed that little pieces of heating element may start flaking after some use, though this does not happen to many. 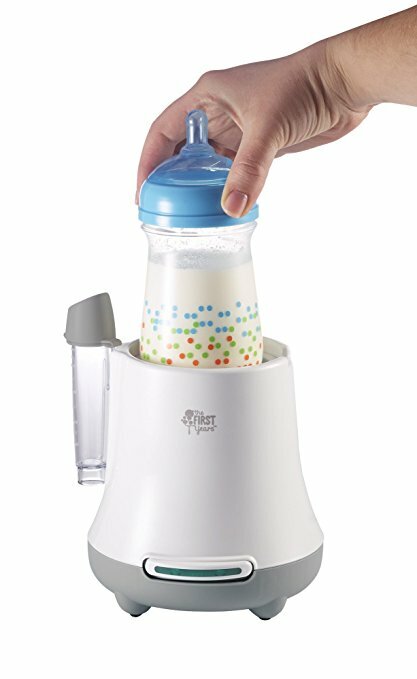 If you do not want to spend too much on a bottle warmer but still want all functions a bottle warmer should have, then the First Years Quick Serve Bottle Warmer is the best baby milk warmer for you. It did not become a best seller for no reason! Another affordable and efficient bottle warmer that is comparable to The First Years, Boon’s Orb Bottle Warmer has everything that you need for a bottle warmer and at a fraction of what you usually pay for most other brands. And just how adorable the design is? Standing on its own, you may not be able to even tell what is it – it can even be a decorative item – and its small and compact design will not take up much of your counter space. In fact, because it is so small, it is also the best travel bottle warmer to bring along your overseas trips. 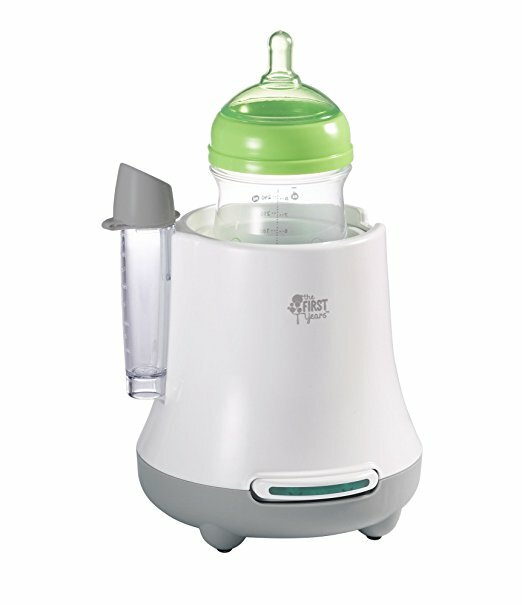 One of its biggest selling points is that the Orb steam heats bottles and baby food jars without hotspots. Water is refilled at the back of the chamber and a graduated tube for measuring water to be steamed is included for your convenience. Also, do not be fooled by its size – the Orb is so versatile that it can fit baby bottles of most brands and sizes, be it regular, angled, wide neck, disposable or even silicone bottles. 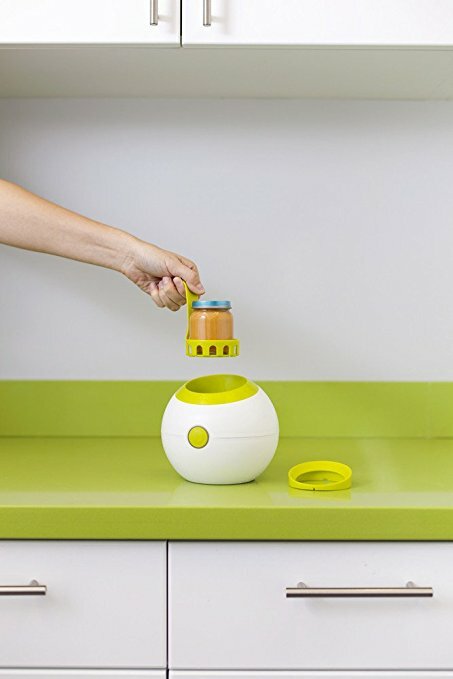 The Orb also comes with a basket for baby food jars, and breastfeeding mothers will be delighted to know that it can also warm frozen breast milk storage bags. Once warming is done, the Boon Orb will automatically switch off with its integrated auto-off function to give you peace of mind. What’s also reassuring is that it is BPA, phthalate and PVC free. One of the downside of the Orb is that it takes 3 minutes to warm up a bottle, which some parents find long. Also, many parents find that the instruction manual that comes with it does not provide clear directions. Nonetheless, the Boon Orb Bottle Warmer is unbeatable with its price point and is the best portable bottle warmer because it is so small and light. 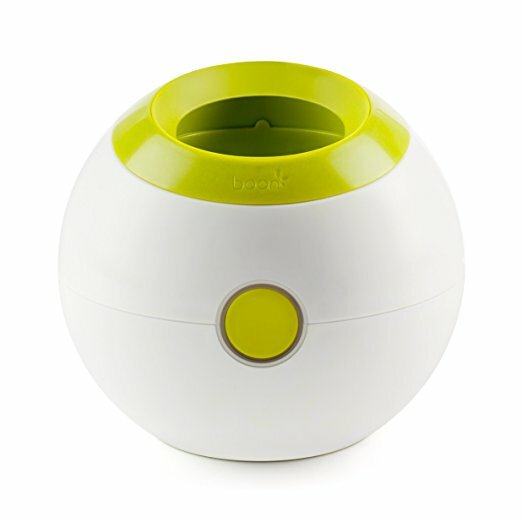 For those that do not want to spend too much on a bottle warmer, the Boon Orb is the best baby bottle warmer choice for you. 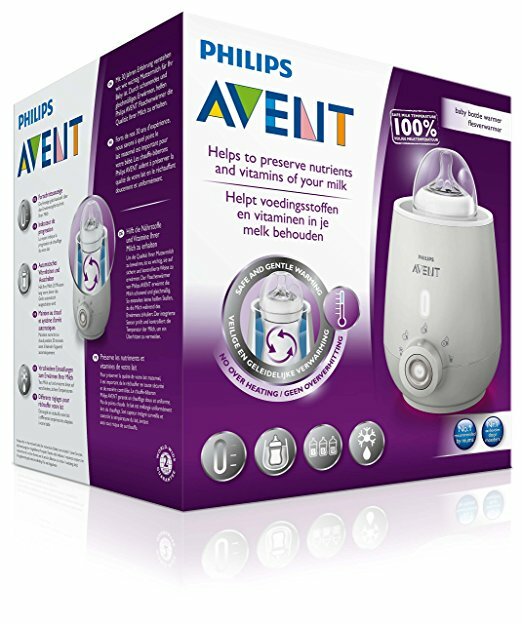 The Philips AVENT Premium Bottle Warmer is designed to gently and evenly heat up bottles with one aim in mind – to preserve the vitamins and nutrients of milk. This is done so by using flowing warm water bath to gently thaw and warm breast milk. 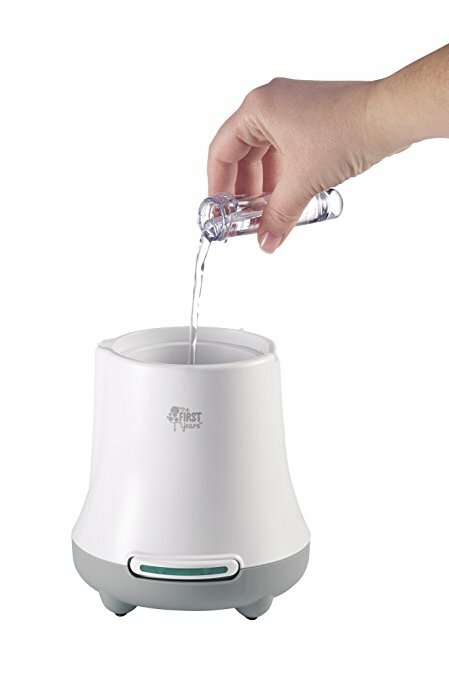 If you are after a water warmer for baby bottles, this is the best baby bottle warmer for you. 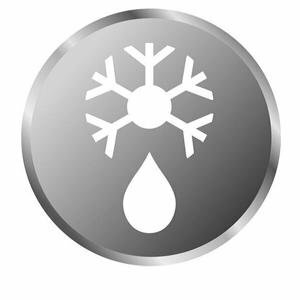 Integrated sensors track and control milk temperature so as to prevent overheating which is one key factor in killing off milk nutrients. As heat circulates the milk or formula during warming, it won’t cause hot spots. On top of that, you get to choose from three warming settings to choose the right temperature for your baby. Besides warming, you can also use this warmer to safely thaw frozen breast milk or baby food. You will know when it is ready by looking at an indicator light on the warmer. It fits all Philips AVENT bottles, cups and baby food storage cups, so if you are using any Philips AVENT bottles or has a Philips AVENT 4-in-1 Electric Steam Steriliser (see our review post here), we recommend you getting this Premium Bottle Warmer as well to complete the set as all three products work perfectly well together. 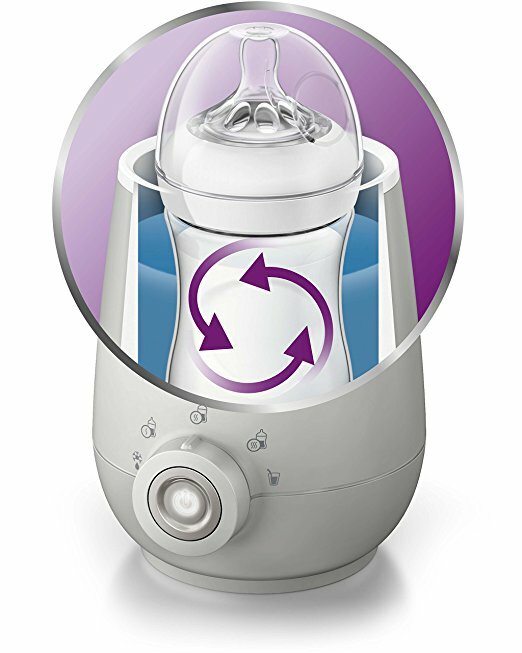 If you are using other bottle brands, don’t worry, the Philips AVENT Premium Bottle Warmer fits most other bottle brands and sizes as well. An upgrade from the Fast model, the Premium warms 3-5oz bottle in 10 minutes and will continue to keep the bottle at a controlled temperature for 20 minutes. It also has an automatic shut off function after 20 minutes which the Fast does not have, and this is a great improvement that parents love, aside from the keep-warm function and progress indicator visual alert when food is ready, both of which the Fast model equally lacks. 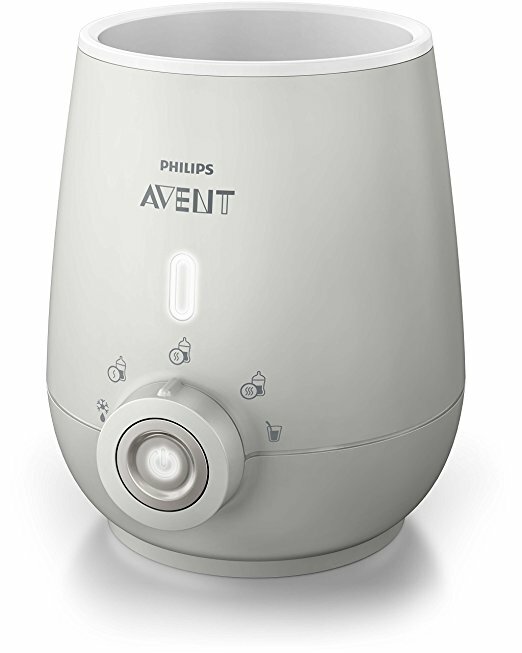 The gentle warming feature of the Premium may not be ideal for some parents who prefer to heat up their bottles fast as the Philips AVENT Premium Bottle Warmer takes 10 minutes to warm 1 bottle. However, in return of the slow warming, you get consistent and appropriate temperature for your bottles so most parents will not mind the extra time. Aside from the warming time, there does not seem to be any other downside to this bottle warmer as most shortcomings that were found in the Fast model, such as automatic turn off function etc. has been addressed and upgraded in this Premium version.